I was quite surprised when this sample popped through my letterbox (it was a really nice surprise though, as my week had been long!). I really didn’t think Macallan would need anyone to review this. After all, it’s the Macallan Jubilee bottling for God’s sake. It’s got the Queen’s face on it, it’s a Jubilee year, it’s Macallan. All of these elements mean that it will sell and sell quickly. 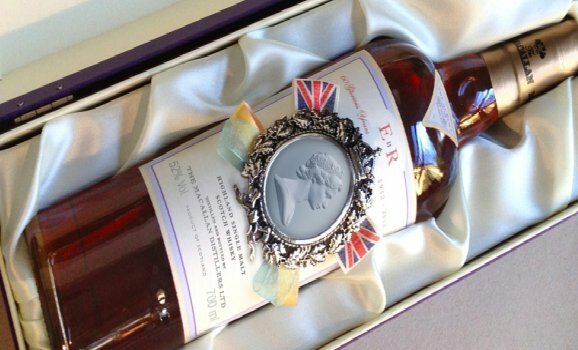 It’s limited to the UK, so all of those overseas royal family fans will have to buy it on auction sites, Ebay, or any of the other places that whisky is bought and sold in the wild west that is the collectibles market. Nose: At first, honey, followed by raisins, pralines, white chocolate buttons. For me, it’s quite a delicate and refined nose. Quite lovely. It’s pretty cold in Casa Hoban this evening, so I am warming the glass to see if this whisky has more to say. Stewed apples and a little hint of nutmeg after warming. Palate: At cask strength, it is too strong. That may sound stupid, but let me explain. Some whiskies at cask strength are fine. You exclaim “that doesn’t taste like 60 per cent!” but there are other whiskies that need water. Without water it just had a slight caramel hint, slight honey hint and a fire. With water: Spice, oakiness, tannins, light grapey notes and light notes of plums. I want more from this! On the nose it showed potential, but it just doesn’t take my breath away. It’s fine, but almost feels a little restrained. I want more fruitiness, sherried notes and honey. Finish: Actually, the finish is quite nice. Bit more sweetness. Overall: If you love the royals, go for it. It’s a funny dram, because the nose is lovely, and the finish is grand, but the palate just lacks a little punch. If you want an awesome Macallan, buy the 18yo instead. Buy 2 or 3 bottles. It’s stunning. This entry was posted	on Tuesday, June 5th, 2012 at 9:44 pm	and is filed under Reviews. You can follow any responses to this entry through the RSS 2.0 feed. Responses are currently closed, but you can trackback from your own site.